« Winners of the 20 Millionth Online Game Giveaway! Fictionaire – The Quiz Game with a Whiff of Truth! In Fictionaire, players make up a bogus definition or fake answer for a word or question asked by the game’s host, trying to trick him or her into believing that their answer is correct. To earn points, players either choose the right definition – or get someone to pick their answer. If a player bluffs someone into choosing the wrong answer, they earn a bonus point. Designed by Hervé Marly, the Fictionaire Game Series will include 4 differently themed card packs, each with 120 thought provoking questions. 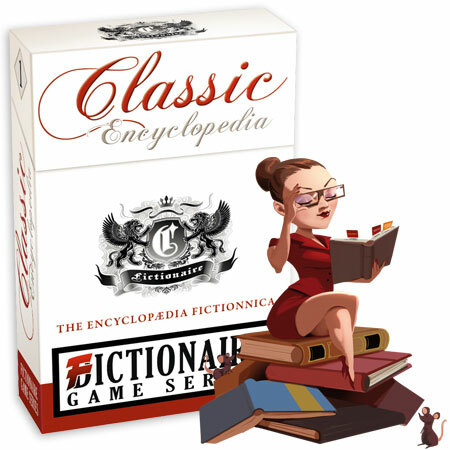 The first pack in the series, Classic Fictionaire, is closest to the traditional dictionary game – rare, interesting and sometimes provocative words, all begging for players to come up with creative definitions. So what are you waiting for? Head over to the Fictionaire website and learn more about this game of inventive storytelling, trivia knowledge and supreme bluffing skills. Fictionaire is designed for 4 to 7 players and will be available worldwide in both English and French language versions in early September 2010. The entire game series will be available to retailers in a free, counter-top display that contains 20 packs – 5 each of the 4 differently themed packs. The price of each deck of 120 questions is $10 and €8. This entry was posted on Wednesday, June 30th, 2010 at 13:47 and is filed under Fictionaire, Games, News. You can follow any responses to this entry through the RSS 2.0 feed. Both comments and pings are currently closed. I guess in looking over the game website, it acknowledges its roots in prior definition bluffing games. Still, I don’t necessarily feel like I need another one…though new cards/definitions would make a nice expansion to the ones we have, but even then we don’t play those old ones that often any more.